Live elegantly at the Greens of Sally Creek, a newly built mid-rise rental community. A collection of contemporary, condo-like one-bedroom-plus-nook and two-bedroom-plus-nook suites are available now. Spacious open concept suites are finished to the highest standard with gourmet kitchen with an island and stainless steel appliances. Enjoy elegant features including lavish bathrooms, in-suite laundry, balconies and expansive windows for bright interiors. Experience Sally Creek for yourself. 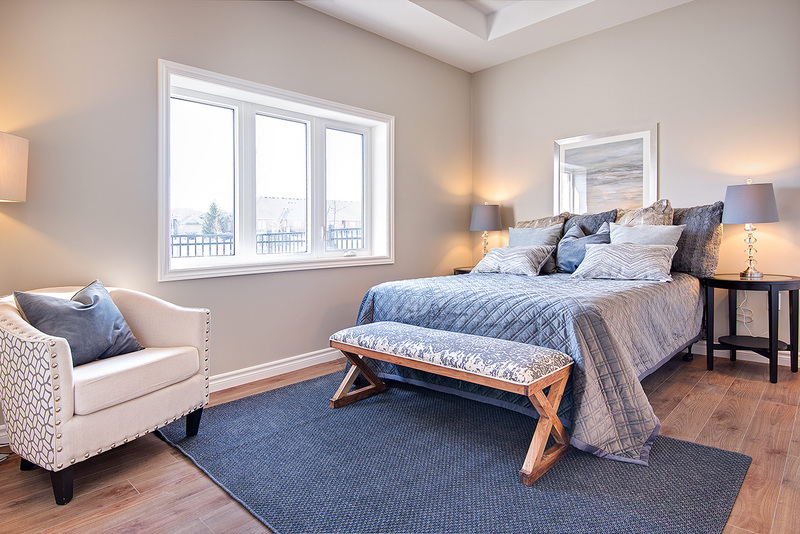 Take a tour of our exquisite designer decorated Model Suites. Picture your life here in a fabulous new mid-rise community in Woodstock with condo-like suites and amazing amenities. 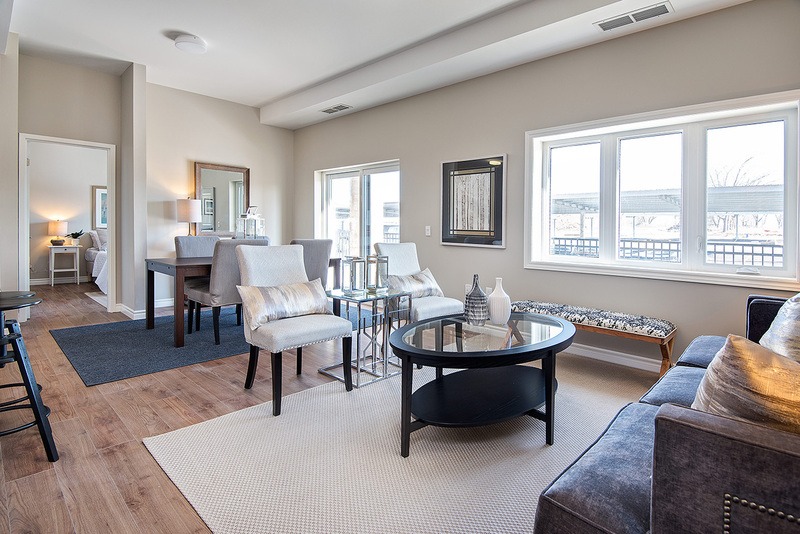 Enjoy elegant features including laminate flooring, contemporary fixtures, air conditioning, stainless steel appliances, washer/dryer and private balcony in every suite. Luxury rental living offers an elevated level of convenience, worry-free maintenance and security so you can live, play, work and travel without a care. Once you and your friends step inside, the lobby will welcome you home in style. Enjoy the designer decorated seating area that will invite you to linger and chat. Birthdays, celebrations, parties are fun and easy at The Greens of Sally Creek. The designer Party Room is equipped with a kitchen, dining table with chairs and large TV for any gathering, from celebration to meeting. It’s your party. A healthy you is only an elevator ride away. Work out without going out, especially in winter. Save on your gym membership fees too! With an equipped fitness room right in your own building, including state of the art cardio equipment and weights, achieving your fitness goals and maintaining your routines is easy, all year round. Everything I would ask for is here. It’s amazing. There’s plenty of room in the suite, with 2 bedrooms and a den my husband calls his ‘man cave’. The features are very luxurious and it feels very spacious. There’s a gym and a party room so we can still have big family dinners. And the golf course is right here – we both love to golf! All in all, it feels like condo living without expensive maintenance fees. Love it! The kitchen is fabulous for us. We like to prepare food together – more fun and creative that way! Everyone has been so welcoming whenever we meet new people at the gym or the golf club or over at the Community Centre. We’re very proud of our new home – and we just love showing it off. Everyone thinks it’s a luxury condo – feels like it too! Now that I’m on my own since I lost my wife, I’m so pleased I found Sally Creek. The suite is well designed with everything I need and building amenities too. Even my own in-suite laundry – my daughter says that’s rare in a rental. But the golf course across the road is why I am here. 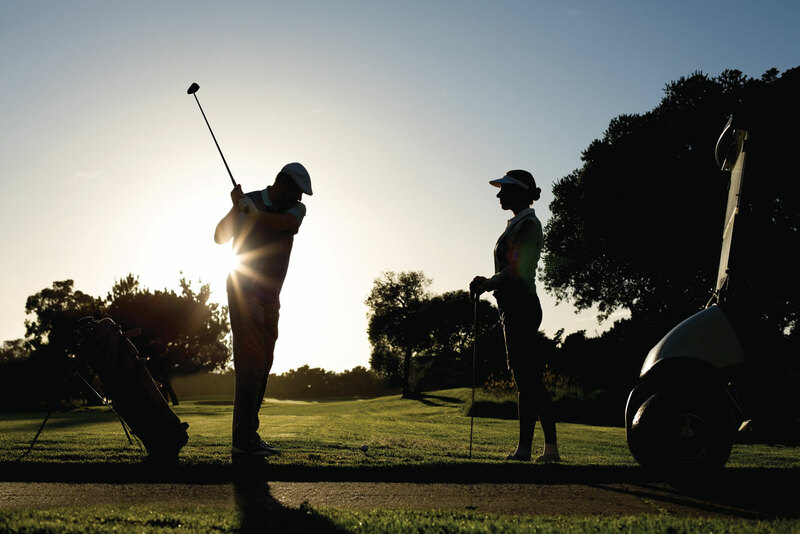 It keeps me active, enjoying life with friends on the course and at the Bistro. Suits me to a tee! 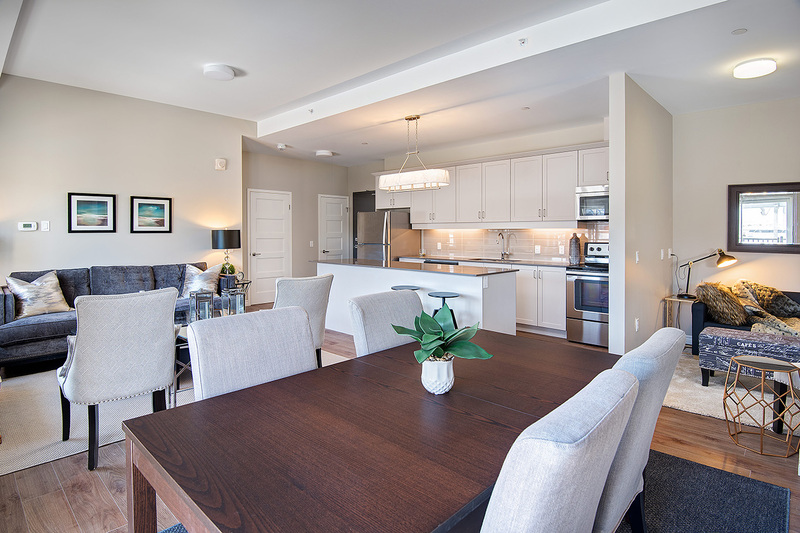 Spacious open concept suites are finished to the highest standard with gourmet kitchen with island and stainless steel appliances. Elegant features include lavish bathrooms, bedrooms, walk-in closets and balconies – as well as the ultimate convenience, an in-suite washer and dryer. NOW RENTING. MOVE IN TODAY! Property Owned and Managed by Northview Apartment REIT.